I have several times thought about putting together a list of resources about social media for science communication, that would be handy to refer others to and useful for myself. I figured it should include published literature and blog posts about social media for science communication and guides on how to use it. But with new things published almost every day and life in general it has never really happened. BUT luckily someone else have been working on such a database, focusing mainly on Twitter! 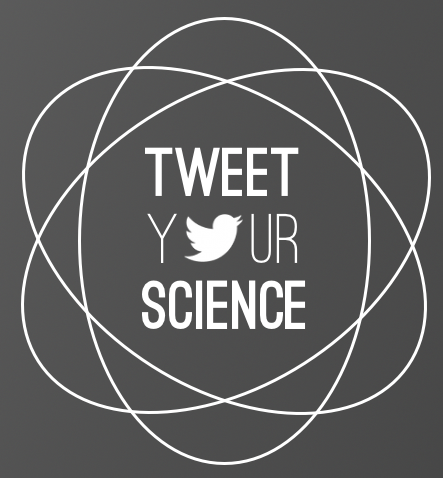 Lunched just a few days ago Tweet your Science sets out to diffuse scientists’ hesitation of getting on board social media by providing a guide, reviews, evidence and a database of scientists who are already on Twitter – everything the average scientist needs to start tweeting their science! The person behind the website is Kimberley Collins who has created it as part of her Master’s in Science Communication at the University of Otago, New Zealand. The website is extremely simple. Focus has thus far definitely been on content and not layout, and a first glance can send you off a bit confused. It’s not always clear where to click to get to the database, guideline or resources and intuitive links are missing here and there (for example it’s not possible to link directly to the guide but only to individual chapters of the guide). But when you dig into the resource pages it reveals itself to be quite comprehensive, and super useful. A nice little feature in the resource section is that next to every linked article is a Twitter button so that you can directly share the article with your followers on Twitter. Very much in the spirit of tweeting science. The Guide to Twitter provides step by step guidelines from how you create an account, edit your profile, start tweeting and start to follow others. It also explains Twitter abbreviations such as MT, RT and HT. Even the least IT savvy person should be able to get on Twitter following this guide. Tweet your Science is of course also on Twitter (@tweetyoursci) and Facebook. As part of the launch festivities, an official launch and panel discussion will be held on Friday the 2nd of August 2013 at the Centre for Science Communication in Dunedin, New Zealand – it will of course be streamed live and participation in the form of questions and comments from around the world is encouraged by tweeting to @tweetyoursci. I look forward to going through the resource list and to following the further development of this great initiative. I can’t think of a more appropriate place than Twitter to come across an article about the use of social media to disseminate public health information. I regularly do a Twitter search for ‘public health social media’ and very often come across new interesting initiatives, reports, meetings etc. Today’s finding was the article Putting the Public into Public Health Information Dissemination: Social Media and Health-related Web Pages. The article, written by Professor Robert Steele and Dan Dumbrell, both from the Discipline of Health Informatics at The University of Sydney, takes a closer look at social media as a tool for the dissemination of public health information. To me, this table captures in a very precise way many of the advantages and new possibilities of social media. The ‘push’ and ‘pull’ analogy for the mode of disseminating information is very telling. I also find the interaction difference of ‘community and peer-post-based’ vs. ‘individual’ based interesting and particular relevant to the field of public health sciences. 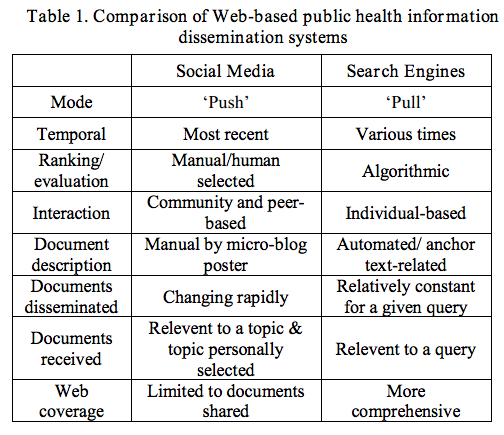 In addition to the comparison of social media and search engine-based web document retrieval, the paper presents the results of preliminary analysis of a sample of public health advice tweets taken from a larger sample of over 4700 tweets sent by Australian health-related organization in February 2012 and discusses the potential of social media to spread messages of public health. All in all the paper has a lot of very interesting perspectives and makes a call for more research in the area. I’m looking forward to hearing more as they get deeper into the analysis. For example it would be interesting to learn about which hashtags (#) the analysed tweets were assigned, if any.